Well, it's becoming clear that if your V-12 powered Jaguar suddenly dies on the road without warning when it is warm, but happily restarts after a short rest, you might be suffering from an intermittent open circuit in your Coolant Temperature Sensor. This is the sensor right behind the thermostat housing at the front of the B bank. If you suspect it is the cause of your engine failure, you can unplug the harness from the sensor, take a DMM, set it to measure OHMS (resistance), then put the probes down on the two pins. If the engine is warm, you should get a reading around the mid-200's. If instead, you get an infinity reading (which may display as 0, but is notably different than the 0 reading you get if you contact the probe tips together), your sensor is "open", which it should never be. There've been about three posts on this failure on the Jag-Lovers list in the past month or two, and prior to that, one listmember, travelling up from San Diego to the San Francisco area for a meet was suffering the symptoms, and had thought it was their fuel pump, only to discover that it was the coolant sensor after they returned home (THAT must have been a long trip). Fortunatley, I haven't had this failure myself, though in the process of diagnosing a failure to pass a California emissions test (subsequently remedied via replacement of an unrelated component), I thoroughly tested both the coolant and air temperature sensors and computed their thermal coefficients, which I used to plot a complete table of resistance-to-temperature values. In that table, 88'C (opening temperature for the stock thermostats, and therefore a reasonably expected operating temperature for the engine), is 260 ohms. 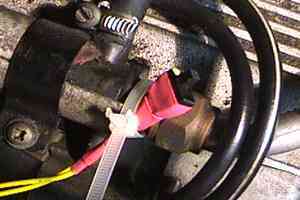 Thus, if you suffer a sudden engine shutdown as described above, a temporary "Limp Home" fix is to pull the connector from the coolant temperature sensor and jam a 260 ohm resistor into the harness connector. This will fake the ECU into thinking the engine is at operating temperature (which is a damn sight better than an open circuit, at least according to the ECU). Well, this would be fine as long as you had an appropriate resistor sitting in your toolkit. Chances are, you don't have any resistors sitting in your automotive toolkit (if it is any consolation, neither do I). Not helping matters, 260 ohms isn't a standard value. That's easily remedied through application of the laws of series and parallel resistance, where the use of more than one resistor can enable you to produce a desired resistance close to the value which you really want. I went down to my workbench, and rummaged through my semi-organized electronic component bins, and extracted a 220 ohm and 39 ohm resistor, as well as a 2.2K ohm resistor, a double pole double throw slide switch, about two feet of 16 AWG wire, as well as some shrink tubing, then set out to build a gadget to keep in the toolkit (that'd be the one IN the car, not at home <g>) should this event ever choose to befall me. The resistor values were chosen from a variety I had available because the 220 and 39 ohm resistors, when soldered in series, arrive at 259 ohms (or very nearly so, considering that these are 5% (gold band) tolerance resistors) - that's 220 + 39. I had some 270 ohm resistors (just one would have done), but due to the coefficients of the temperature sensor, at the higher temperatures (around operating temp), a few ohms can result in a difference of several degrees, and I felt like being retentive, not that the difference would cause much effect (referencing the table, I see that we're talking all of 1.5'C difference, which the ECU is hardly going to notice, but I'm retentive just the same and chose to target the desired value since I could). 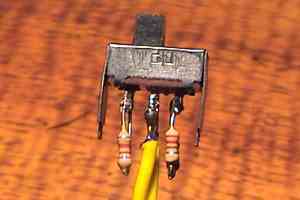 Likewise, a pair of 470 ohm resistors in parallel (the resistance of which is computed as (R1*R2)/(R1+R2) ) would produce a sufficiently close value of 235 ohms (92'C, a bit warmer than perhaps you'd rather), or, better a pair of 510 ohms in parallel, at 255 ohms (89'C, nearly spot on), or even a 470+510 in parallel (245 ohms, or 90.5'C), if you don't have two 510 ohm ones on hand. A wide variety of other resistance values can be used if you know the math and have a pair of resistors that work into the equations right. 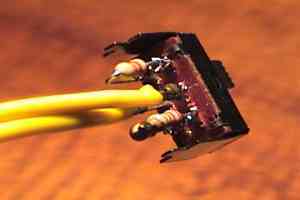 In any event, I had what I needed, and proceeded to cut the legs short on the common side of the two resistors, solder them together, bend them over, and cut and solder them to a pair of legs of the slide switch. 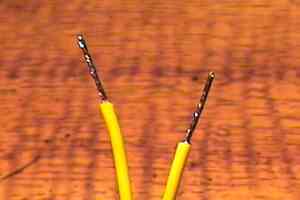 I bent and cut the 2.2K ohm resistor leads and soldered it to the other pair of poles, then stripped and tinned the ends of two approx one foot long pieces of 16 AWG stranded wire, and soldered one end of each to the common leads on the centre of the slide switch. 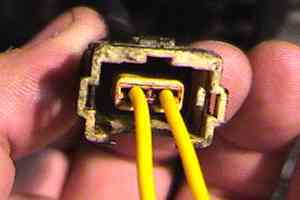 By tinning the opposite (as yet, unused) end of the wires, we keep them from fraying. I tested the output at the leads - 260 (or nearly so) on one switch setting, and 2.2K (or nearly so) on the other. I marked the 260 ohm position with some bright yellow fingernail polish (I use it for electronic thread lock and tamper indicator, and it's so gaudy, it's cheap), though scratching or otherwise marking the side you want the switch to be in for RUN is the only goal here. I should explain the 2.2K ohm resistor -- that corresponds to a coolant temperature of about 23'C (74'F), which is close enough to "ambient" for a motor which isn't warm (I had plenty of 2.2K resistors, and this worked out fine). In reality, anything from a 1.7K to a 3.3K ohm would probably suffice -- at this setting, the ranges are wider (due to the coefficients), and since this isn't the RUN setting, the precision is less of a concern. 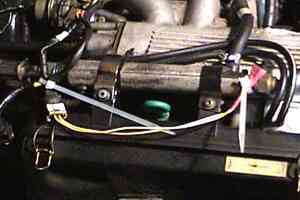 The idea is that if the engine is cool, you want to switch the switch off of the RUN setting (thus selecting the 2.2K resistance), and let the engine warm up (the ECU runs rich when it senses the coolant to be cool), and after it has warmed up sufficiently, switch it to the RUN setting (the ECU will lean the fuel mixture to the appropriate range), close the bonnet and go. Arguably, if you didn't want to deal with that, you could just get an appropriate 260 ohm or so resistor value and cram it into the sensor plug harness and leave it at that. I figure as long as I'm going to have a special tool in my toolbox, I may as well make it a bit better, which may save me some grief when I'm stuck on the side of the road, which is something everybody hates, but especially Jaguar owners, who don't like to propagate that misconception that Jaguars are "terribly unreliable". 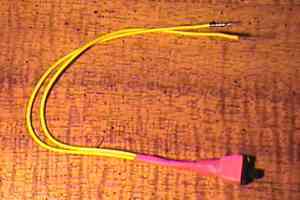 Then I took some appropriate sized pieces of shrink tubing and enveloped the resistors and wire leads with them and shrunk them (with the heat from the flame of a butane torch, though a lighter would do, so long as you don't hold it in one spot and burn the tubing). Then I sealed the switch base in a larger piece of tubing (and, retentive me, tapered it with progressively smaller diameter pieces). 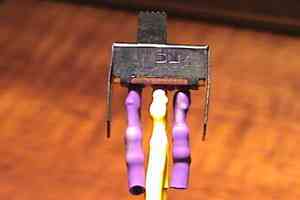 The tinned leads are rigid, and insert into the contacts on the plug harness easily, but are held firmly enough that you can actually lift and move the harness around with the wire, and not risk the wires falling out (this is important, since if they do, you'd have an open circuit again). I have several wireties in my toolkit as well - both single-use and releaseable varieties. 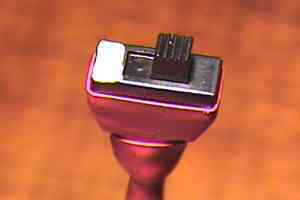 The releaseable ones would work well for this, since it is a temporary fix, and you can position the wires as needed. Note that it is shown here pictured installed in my '85 merely as a demonstration - neither it or my '88 have suffered this failure. Total cost: well, it was made entirely from bits I have on hand, but all told, the components necessary to make this can't cost you more than perhaps US$2 at a Radio Shack or similar store, though the heat shrink tube (excellent stuff to have on hand for all sorts of electronics work and repairs) will probably set you back a little more pocket change, unless you can find a package of various sizes. I would be remiss if I didn't note that one lister did suggest simply purchasing a 5K ohm potentiometer, since in effect, all you'd have to do is solder the leads to it, and then note the exact location the knob needs to be at in order to result in specific resistance values, which would allow you to simply turn the dial to "cold" and "hot" settings if you wanted. While this should work (and the adjustable range is certainly more versatile than the simple "cold" and "hot" settings of the slide switch presented here), I don't favour the potentiometer approach for a couple of reasons, not the least of which is repeatability and stability -- the rotation of such a pot is likely to be too small to allow for a precise control at the end where it matters the most -- where the engine is hot -- by using fixed resistors, you're just about assured of precisely the value you want. 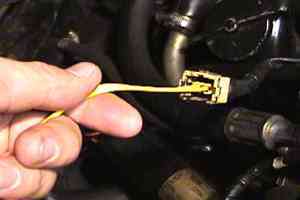 If you suffer a coolant temperature sensor failure, you should get it replaced in short order, so that your engine can run as designed -- this gadget isn't intended to substitute for a proper coolant temperature sensor, but it can serve to get and keep your car running if you suffer such a failure while on the road. I'm determined not to be stuck in that situation, and having a workaround prepared gives me the peace of mind that should the sensor fail, I won't be inconvenienced more than a couple of minutes.